Rebound off 1.4218 tested Flag top (see graph), but pair still below the neckline of a daily Double Top off (1.4626: 1st target at 1.4188 having been approached on drop from last year high). 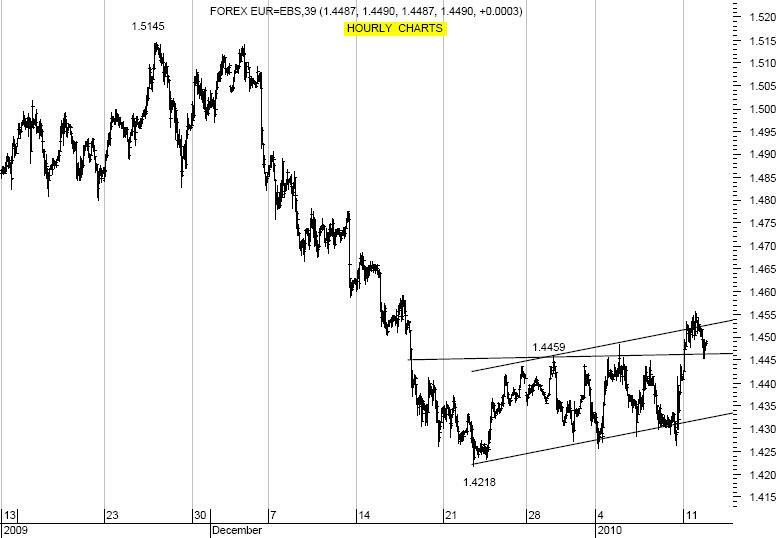 Support area at 1.4453 (today’s low? ), with next levels at 1.4432/ .4427 (daily envelope bottom/ daily Short Term Moving Average↑ + break-up hourly), ahead of 1.4393/ .4386 (broken weekly Short Term Moving Average↓/ daily Medium Term Moving Average↑) and 1.4373 (daily Bollinger midline): ideal area to stay above to keep current better mood on €. Resistance at 1.4516/ .4521 (daily Bollinger top/ today’s high? ), with next levels at 1.4557 (current week high) and 1.4567/ .4572 (daily Long Term Moving Average↓/ 38.2% 1.5145 to 1.4218) and 1.4586 (daily envelope top): tough on 1st attempts.